In February 2008, Bated Breath Theatre Company embarked on a journey of anthropological proportions to Parkville, Hartford. Inspired by the vibrant history, the company interviewed local residents, business owners and seniors. Their words are brought to life in this moving portrayal of the immigrant experience from 1930 to the present day. Weaving together original text, movement, music, puppetry and projection, The Parkville Project tells the story of an undocumented worker caught up in an Immigration Customs Enforcement raid in Hartford. As her life is thrown into relief, she is faced with tough choices, comic characters and enduring memories. 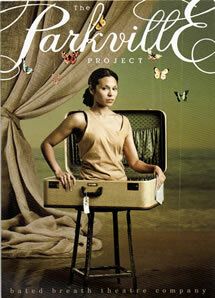 The Parkville Project is a Bated Breath Theatre Company and Playhouse Theatre Group, Inc production. Join us for community events prior to the premiere of "The Parkville Project"
Bated Breath exists to breathe new life into the theatre experience, creating dynamic and contemporary interpretations of classics and new plays. We invite our audience to engage with the work in non-traditional and traditional theatre spaces, encouraging an interaction that is both personal and communal. Bated Breath is committed to celebrating the diversity of its audiences through its groundbreaking work. We are a collaborative group of theatre artists combining a variety of disciplines: physical theatre, text based theatre, puppetry arts, and visual arts. We are dedicated to breathing new life into the theatre experience, allowing audiences to engage with the work. Helene grew up in Norway, the USA and England where her acting career spanned twenty years in theatre, television, radio and film. Highlights include the BAFTA /Cannes nominated Tomorrow La Scala, the Olivier award winning Burning Blue, theEmmy winning Prime Suspect : Inner Circles and the National Theatre’s King Lear /Richard III opposite Ian McKellen. In 2002 she returned to the USA and joined the Department of Dramatic Arts at The University of Connecticut as Assistant Professor in Residence where she teaches Acting and regularly directs for the Connecticut Repertory Theater. She holds a BSc in Anthropology from the London School of Economics, is a graduate of The Drama Studio, London and an alumna of the Lincoln Center Theater Directors Lab. In 2008 Helene translated and directed A Doll’s House at The Gene Frankel Theater, New York for Bated Breath Theatre Company. Helene is directing their current piece The Parkville Project. Michael Bradford is an Associate Professor of Dramatic Arts at the University of Connecticut, where he teaches theatre history, dramatic literature and playwriting. Michael holds a Bachelor of Arts from the University of Connecticut and a Masters of Fine Arts from Brooklyn College CUNY. He has written numerous full length and one-act plays produced at various venues in NYC, to include Off-Broadway at the American Place Theatre and the LARK Developmental Theatre, as well as regionally at the eta Creative Arts Foundation, Inc. (Chicago, Il. ), and A Contemporary Theatre (ACT) (Seattle, Wa.). His residencies include the Manhattan Theatre Club Playwright Fellowship, the New York Stage and Film Company Residency at Vassar, NY., and the Connecticut Commission on Culture and Tourism Writing Fellowship. His work is published through Broadway Play Publishing, Inc.